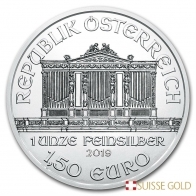 New 2019 Austrian Philharmonic 1 oz Silver .999 Fine box of 500. 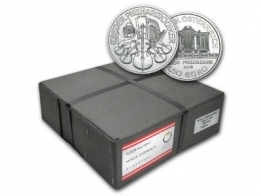 Each box contains 500 x 1 Ounce Silver Philharmonic coins, in 25 tubes of 20 pieces each. The front of the silver Philharmonic coin depicts an image of a series of musical instruments used by the Vienna Philharmonic. The reverse of the coin features the weight, year of minting and the face value of the coin. Each 1 Ounce silver Philharmonic coin has a face value of 1,50 EUR. The silver Philharmonic coins are very popular for silver investors, particularly those looking to invest in silver within the EU. The monster box is a great way for individuals to invest in silver coins in larger quantities. Monster boxes of silver Philharmonics carry a lower premium than purchasing individual coins. The silver Philharmonic coin is produced by the Austrian Mint. 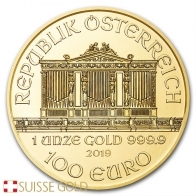 The Austrian Mint produce the Philharmonic coin in gold, silver and platinum. The Austrian Mint also sell a range of gold and silver bars which are available to precious metals investors in Europe. Please contact us to sell silver philharmonics.